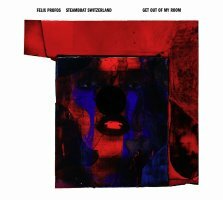 The sixth record of the Avant-Core-Noise-Trios Steamboat Switzerland is a joined work with the composer Felix Profos. To his quadripartite score Get Out Of My Room in which each note is exactly set the musicians of Stemaboat Switzerland react in their particulary own way. Thus, there is no improvisation over a theme but a fight against employing sound walls, mostly compact and microscopical gracefully built at the same time. Get Out Of My Room founded by the SWR was firstly performed during the Donaueschinger Musiktage in 2006.